For quite some time now, a colleague at work has had this overly large skateboard propped up against his desk. I've never questioned it and never seen him actually using it and always thought it was some gimmicky toy somehow related to TopGear as it has "CoolBoard" written on it - I'm a techie by trade so it's not uncommon to encounter strange toys and gadgets in the office. Anyway, the other day we were discussing our ailments and the core strengthening exercises prescribed by my physio to help with my hip and that's when he explained his fancy skateboard to me. It's not a skateboard. 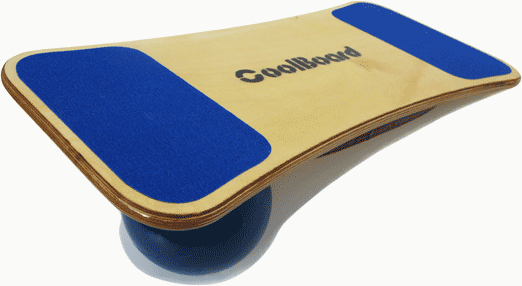 It's a CoolBoard - essentially a skateboard shaped plank of wood which you then stand on whilst balancing on a 5-inch ball - which, to quote the website, is "the most effective and engaging trainer for balance, core strength and stability, stabilising muscles and proprioception". With the brief explanation given to me, I just had to give it a go. It looks simple enough, but I soon found out it was anything but simple. The first challenge is getting upright and balanced and then maintaining that balanced position. I've used it for about 30 mins a day on 3 of the past 5 days (I didn't use it on the weekend) and I think I'm starting to get the hang of it. Getting up, balanced and maintaining the balance is now possible, though I can't do it for much longer than about 30 to 60 seconds at a time. I can certainly confirm it does a brilliant job of working your core muscles and the stabilising muscles in your legs and I'm very impressed. This simple little device provides quite a workout and it's way better than any other core stability device I've used before. The goal now is to get up to a balanced position without any support and then hold the position for several minutes at a time. When this becomes easy, I'll start complicating things by trying to squat or do other activities on the board. Thankfully my colleague keeps this in the office, so I don't need to get one for myself (they're very expensive), though I wouldn't say no if Santa snuck one into my Christmas stocking this year. Hopefully some regular balancing, along with my prescribed exercises, will have the desired effect and increase my core strength and completely and permanently relieve me of the discomfort I sometime feel in my right hip. Only time will tell.